Games have edges. There’s a limit to what they simulate. Even tabletop games, the most unrestrictive sort of game, have boundaries beyond which you hand-wave or make things up on the fly without using the rules. And this is a good thing: it provides a comforting sense of understanding. When you understand the constraints of a game, you can plan and anticipate what’s coming next. In Half-Life, you expect to solve problems by hitting switches and shooting people. If a segment of the game required you to play hide-and-seek with someone, it would be bewildering. Chances are you’d have trouble even understanding how to take the necessary actions. Games establish your expectations as a sort of contract with the player so that you understand what they expect you to do. This can be taken too far. I find the Assassin’s Creed series tremendously boring because of how obvious its constraints are. Every section follows the same pattern. Scout, sneak, kill, escape. There aren’t enough surprises, so the whole thing feels tedious to me. But when you know what to expect, or at least know what sort of thing to expect, you feel in control and powerful. 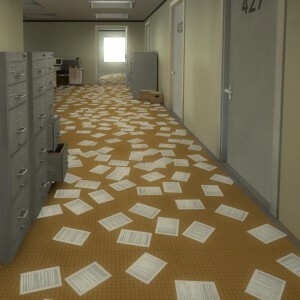 The Stanley Parable does not want you to feel in control or powerful. But there are also random events. Sometimes the office is painted a different color. Sometimes you see someone else in the office, through a window. Sometimes the phone rings and, if you answer it, things are different the next time you restart the game in bold rebellion against causality. Randomness is common in games. Random chances to hit with a weapon, random selections of enemies for a randomly timed battle. However, the randomness usually has bounds. You know when it will happen, roughly what the range of possible results will be, and what the eventual consequences are. Stanley takes this away. The game makes things happen, and you don’t know whether it’s because of something you did or a roll of the dice. You don’t know if it’s something that you can respond to or whether it’s just window-dressing. The internet is full of people speculating on whether they caused a certain event to happen in Stanley or whether it was poor chance.